Sun 19th June 1.45pm scratch Challenge Cup singles, no handicap. Sixteen members competed for the 2016 Challenge Cup. Scott Harries won defeating Cheryl Caswell 21-6 in the final. Losing semi-finalists were Peter Driver and Matt Ealey. Twenty Seven members entered the President's Day Cup causing both greens to be used on a beautiful summer's day. 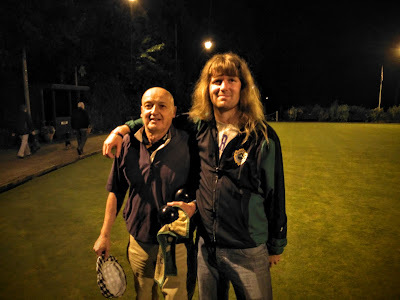 The eventual winner was Scott Harries who defied an owe 2 handicap to beat President Rob Renke 21-10 in the final. Losing semi-finalists were Neal McLachlan and Rob Steventon. Scott Harries, Neal McLachlan, President Rob Renke & Rob Steventon. Fourteen members entered the competition on a beautiful late summer's day, the weather being in complete contrast to that on the original date two weeks earlier. Captain Chris Chamberlain just failed to win his own cup, losing 21-10 in the final to Pete Driver. Losing semi-finalists were Cheryl Caswell and Tony Steadman. Chris Chamberlain and Pete Driver before the final. 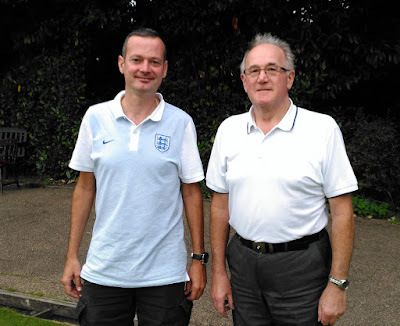 Twelve pairs entered the floodlight doubles which didn't finish until a quarter past midnight with Scott Harries and Rob Renke defeating Tim Ealey and Rob Steventon 21-6 in the final. The happy couple after the final. Club President Rob Renke & Scott Harries.